Srul Irving Glick is one of Canada's most prominent and prolific composers having written in most major forms including chamber, oratorio, orchestral, vocal and choral. Born in 1934, Glick grew up in Toronto where, from an early age, he was immersed in music. His brother Norman was an accomplished clarinettist and his father was a cantor, singing the prayers at synagogue and at home. As a boy, Glick sang in his father’s choir and he spent hours listening to the great composers of the past. He was especially fond of Chopin and the Beethoven and Tchaikovsky Symphonies. At age twelve, Glick began studying piano when his family bought an upright Heintzman, and within a few short years, he passed his grade eight exam. Glick commented that he was so nervous during his exam that his legs shook the entire time. He knew he didn’t want to be a concert pianist. However, he knew quite definitively, from the age of fifteen, that he wanted to be a composer. For the rest of his life he dedicated himself to this craft, composing most of his music on this piano. Glick received his Bachelor of Music and Master of Music degrees in composition and theory at the University of Toronto. He continued his studies in Aspen and then in Paris with such masters as Darius Milhaud, Louis Saguer and Max Deutsch. Glick has recognized the encouragement by Saguer and Deutsch to find and believe in his own voice. Glick commented that Deutsch sympathized with him and encouraged him to write what was natural to him and to be unconcerned with pressures to write serial or avant-garde music. After completing his studies, and all the while composing, Glick joined the Canadian Broadcasting Corporation (CBC) in 1962 where he worked as classical music producer until 1986. His involvement at the CBC in the field of production, recordings and programming won him seven Grand Prix du Disque and a Juno Award. Glick was also choir director and Composer in Residence with Beth Tikvah Synagogue in Toronto between 1969 and 2002. It was there that he composed the majority of his liturgical music. In addition, Glick served as program director of Jewish Music Toronto for four years and the program director of Musica Beth Tikvah. He taught music theory and composition at the Royal Conservatory of Music and York University. Music and art was present in every aspect of Glick’s life. He and his first wife, Dorothy Sandler Glick, would host Musicales at their home, not only featuring musical performances, but prose and poetry readings. Some of those who performed included the Orford String Quartet, Harry Somers and Patricia Rideout, David Lewis Stein, and George Hearn. Other guests to the Glick home included Marius Constant, Pierre Boulez, Glenn Gould, Yo-Yo Ma, Hermann Scherchen, Rosalyn Tureck, and Vlado Perlmuter. This proved a great musical and artistic education for Glick's three children. 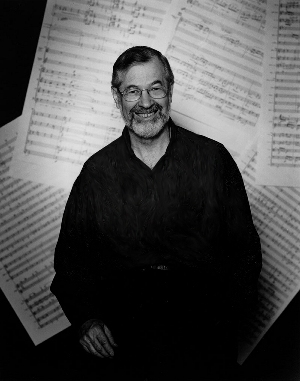 In 2000, Glick received the extraordinary Yuval Award, presented by The Cantor's Assembly of America, for his "lifelong commitment to the composition of music that captures the heart and touches the soul. In 1992, in honour of Canada's 125th Anniversary of Confederation, Mr. Glick received a Governor General's medal "for his contribution to Canadian culture". In 1994, Glick was appointed a Member of the Order of Canada for his "outstanding achievement, service to Canada and to humanity at large".